Simple Age Verification PopUp OpenCart extension is nice plugin to verify the age before entering the site. This is helpful for adult site, smoking or alcohol sites to verify the age before visitor enters your website. Simple Age Verification Popup plugin opens popup in cool lightbox with image and check box with it. See the below screenshop of popup. This is VQMOD extension of OpenCart. VQMOD helps in not overwriting the core files of OpenCart. You can find more info on VQMOD and Download here. Install VQMOD, if it is not installed. Download the zip file, extract somewhere on your computer. From extracted file, upload the the files/folder under “upload” folder to server using FTP, in root folder (where admin,catalog,system folder are available) of OpenCart installation and its done you do not have to do anything else to make it work. Show Reward Point of Customer in Header plugin do exactly what it’s name implies. In OpenCart, After login as Customer to view reward point customer have to go to My Account > Your Reward Points. This Free extension / plugin of OpenCart show Rewards points in Header under Login info. Here is the screenshot how it looks like on default theme. This is VQMOD extension of OpenCart. No Core file is updated using VQMOD. New OpenCart Extension, Auto Add Reward Points add product rewards points to customer immediately after purchase finished. Usually in OpenCart website admin have to add reward point to customer manually by clicking on link as show in below screenshot. Using Auto add reward point extension / plugin for OpenCart do not require to add rewards point manually. It does automatically for admin. 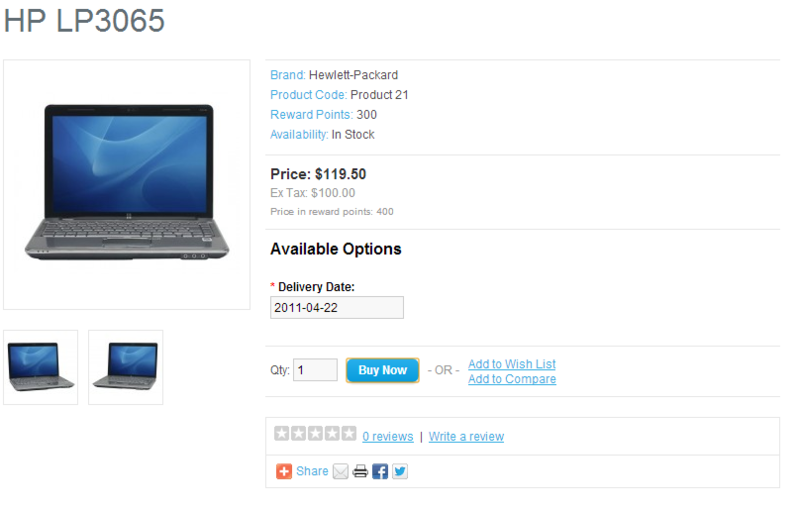 It helps admin in reducing tedious task of adding rewards point for every product purchased. This is VQMOD extension so you require VQMOD to be installed on OpenCart website. You can find the information of installing VQMOD here. It is really easy to install this plugin. Recently we released new Opencart plugin named “Product Buy Now button and Cart in Popup – Opencart – VQMOD“. This is useful extension of Opencart for replacing the “Add to cart” button with “Buy Now” button. Clicking on Buy Now button opens shopping cart in popup. Popup shopping cart is fully functioned. User can change quantity, remove any product, Apply coupon code, etc. in popup itself. Product Buy Now button and Cart in Popup – Opencart – VQMOD extension of Opencart makes your site User friendly and easy access to shopping cart. 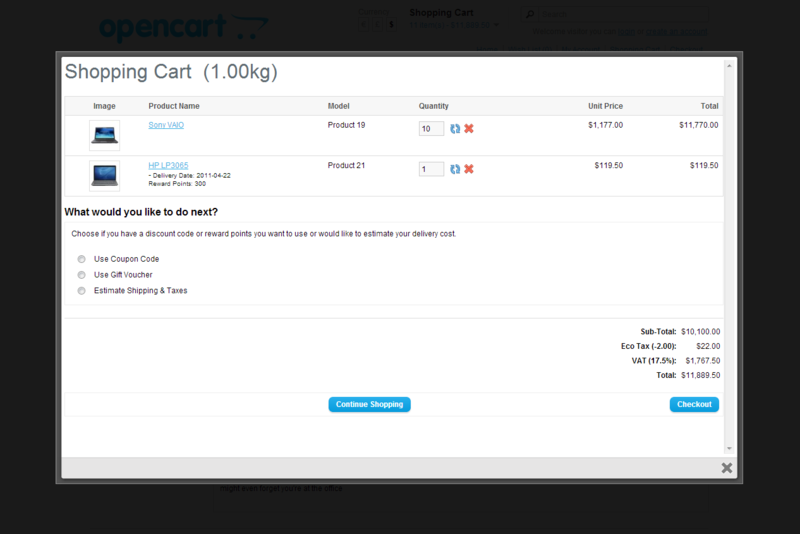 Shopping cart popup is displayed using Colorbox jQuery plugin popup. Colorbox jQuery comes bundled with Opencart installation so no extra file include. This Opencart plugin is developed using vQmod so no core files will be changed. Installation is very easy. This Opencart extension support multilanguage. Here is the screenshot of extension.